Thumbing through cooking magazines is amusing bedtime reading material, especially at this time of the year. “Ho-Ho-Ho: Who are you kidding?”, I mumble, scrutinizing ambitious holiday menus that, supposedly, can be pulled off within the span of several hours. Does the cook get to eat? There are many ways to thicken soups and bisques. Rice is often and traditionally used to thicken seafood bisques, and I particularly enjoy the flavor and texture the rice brings to the bisque when puréed with the other ingredients. This is a deliciously rich and elegant bisque. So much so, I don’t like guests filling up on bisque before dinner. It’s fun to serve it in cognac glasses garnished with a speared shrimp while guests are milling about. There is so much excitement surrounding gift-giving, it’s hard to contain the family around the dining room table. Tomorrow I will be making Spinach-Stuffed Potatoes, another great make-ahead recipe that will complement the Standing Rib Roast. Melt butter over medium heat in a large saucepan. Add 1 pound shrimp & sauté 1 minute on each side. Remove shrimp & add celery, onion, carrot,a a pinch of kosher salt to pan. Sauté 8 minutes. Add tomato paste to vegetables and sauté for two minutes. Add sherry to pan and bring to a low boil 2 minutes. Add 3 cups stock, dried thyme, cream and rice. Cover pot & simmer until rice is tender, stirring occasionally, about 20 minutes. Purée soup in blender, then return to pan. Season with kosher salt if needed and cayenne, if desired. Before serving, sauté reserved shrimp in butter and sprinkle with parsley. Meanwhile, bring soup to simmer, stirring frequently. 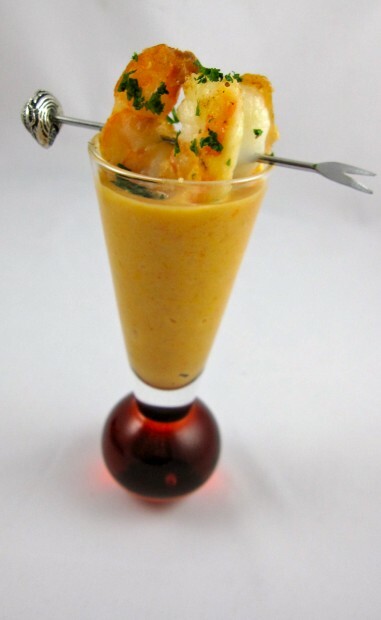 Ladle into bowls or cognac glasses & garnish with reserved shrimp. *Boiled shrimp shells make a great stock; see my Bouillaibaisse recipe for tips on making or purchasing seafood stocks.